Often we need to send sensitive information to other person who is further away. The common way we do this is via email message, attachments or via any web service as a password protected/encrypted file. Now if the data is too much sensitive or if your are too much sceptic, you must know that none of these are full proof because email can be hacked and password protected/encrypted attachments of any type are enough to draw attention about. Now nothing is full proof in the hand of dedicated hacker guys. So, the best way to skip attention is to use some way which is very normal. Anyone can send others a greetings card image or a set of tour pictures or a wallpaper collection. So, little doubt remains if you hide data in these images. Yes! here is what the software Secret Layer Pro comes into play. Its an easy to use steganography software that can hide files and texts in one or more images and allow you to protect it with password and strong encryption methods. You will also be able to extract encrypted information from any such image(s). Installer of Secret Layer Pro is available for download in its webpage. Its a 9.4 Mb file with no digital signature. Software Installation requires administrative rights. It needs 20 Mb of free disk space to proceed. Installation went on smooth and fast. You will get an option to create desktop icon and launch software on installation finish. Secret Layer Pro GUI has a metallic look. Its minimalistic and is customizable. In accordance with the principle of the software, it has two features, one is to Hide Data in image(s). and another is to Extract hidden data from image(s). It does it in two ways either via Wizard Mode, which is more user friendly or via Expert Mode, which offers quicker operation but does not require you to be an expert! In the Wizard Mode of Data Hiding, you will be asked to add image(s). You can add a single image or multiple images. Please note that your hidden data will be distributed among all theses images and you will need all these to decrypt that message. In the next step, you will be asked to add file or text or both. 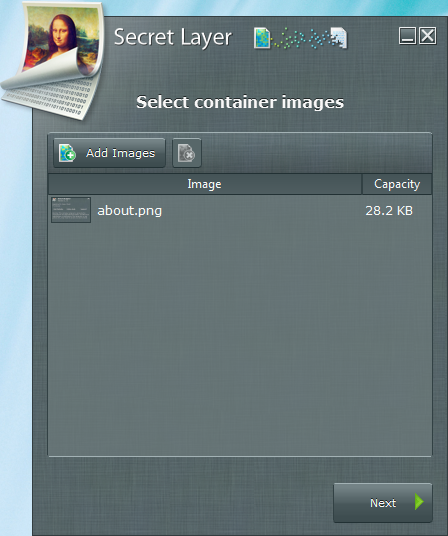 There is only one limitation: total files/text size must be less or equal to the capacity of the images. In the third step, you will be asked to encrypt the image. You will have to add password, choose encryption method and key length. If you are not aware of encryption types don’t worry, the GUI of Secret Layer Pro will inform you about the advantage and disadvantage of each type. 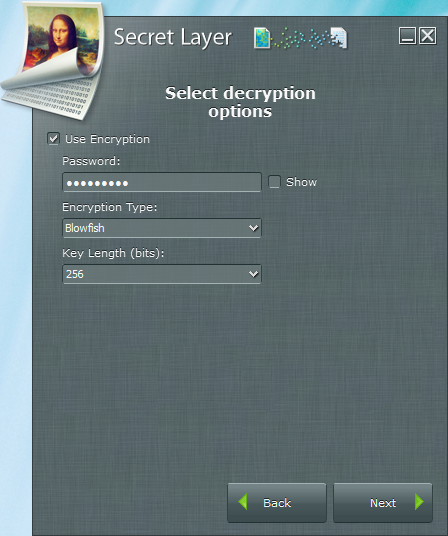 Currently the following Encryption types are supported: AES, Blowfish, CAST-128, CAST-256, DES, IDEA, RC5, Twofish. In the next step, you can start hiding data, after confirmation about all the inputs and output directory. 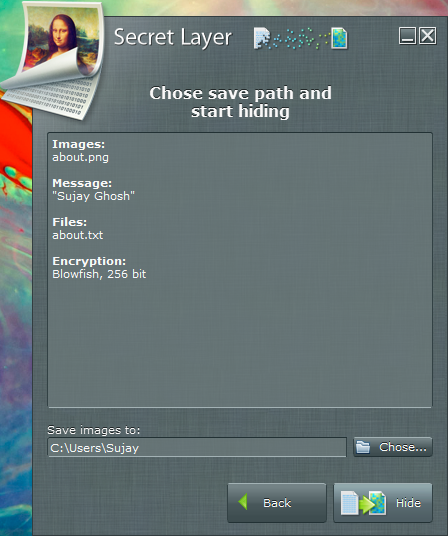 You can set Secret Layer Pro to open output directory, shred original image and file after the hiding process. There is no way to distinguish the image with hidden data from the original image apart from the file size. If you are not hiding a large amount of data, that change is also minimal. If you need to hide a large amount of data, it is recommended to use large number of images so that the average change in image size is small. In the Expert Mode of Data Hiding in Secret Layer Pro addition of image, data encryption, output location all are done within the same window, in different tabs. In the Wizard mode of Data Extraction of Secret Layer Pro, you will be asked to add the required image(s) in the first step. Then you have to input the exact password, encryption type and key length. Please note that any wrong input will not help you to extract the data. In the last step, you will be shown the result of the previous steps and will be asked to extract the data. Your extracted data (File and Text) will be shown in another dialogue and you will be prompted to shred the input image(s). You can copy/save the extracted data to a safe place. In the Expert Mode of Data Extraction of Secret Layer Pro addition of image with hidden data, input of proper password, encryption type and key length all are done in aingle Window and Tab. You manage how Secret Layer Pro will behave by using the options dialogue. You can set to see only the Wizard or the Expert buttons. You can set it to remember the choice of output path and encryption methods. You can also set it to hide the image previews. It is always recommended to use JPG images for the encryption task, since it is the most common format and its easy to blend the encrypted image to a collected of JPG images. If you have decided share your image online, make sure to use a service which will not alter that image quality e.g. resize it. Secret Layer Pro has plenty of online tutorials. Video Tutorials are available too. Secret Layer is available in two versions: Light and Pro. Secret Layer Light is a limited edition for home use. It is enough to organize hidden communication using text messages and small file. Secret Layer Pro on the other hand is fully-functional version for home and commercial usage. It can handle any amount of data. See this link for complete comparison. Lifetime license of Secret Layer Light costs $19.50, while Secret Layer Pro costs $45. This entry was posted in Encrypt, Graphics Management, Software, Windows and tagged Steganography Software.